I tried something different on Sunday. I made a wild rice salad with olive oil, zucchini, red onions, garlic, bell pepper, dried cranberries, salt, pepper, and fresh lemon juice. 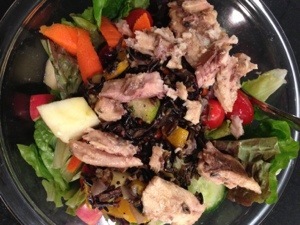 Wild rice is high in iron. It’s great over a salad or on the side of a dish. Here’s my lunch I had today. 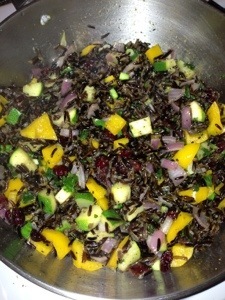 As you can see I added some of my black rice salad on the top. 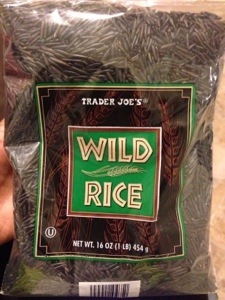 Wild rice is so nutritious. It’s considered a superfood due to all of the healthy source of minerals, especially iron. It contains vitamin E and is lower in sugar than berries that have similar phytochemical qualities. Black rice is fiber-rich and nutritionally similar, though not identical, to whole grain brown rice. To read more about this superfood wonder click here.